The largest Tibetan settlement is at Bylakuppe in Coorg District, near Kushalnagar. 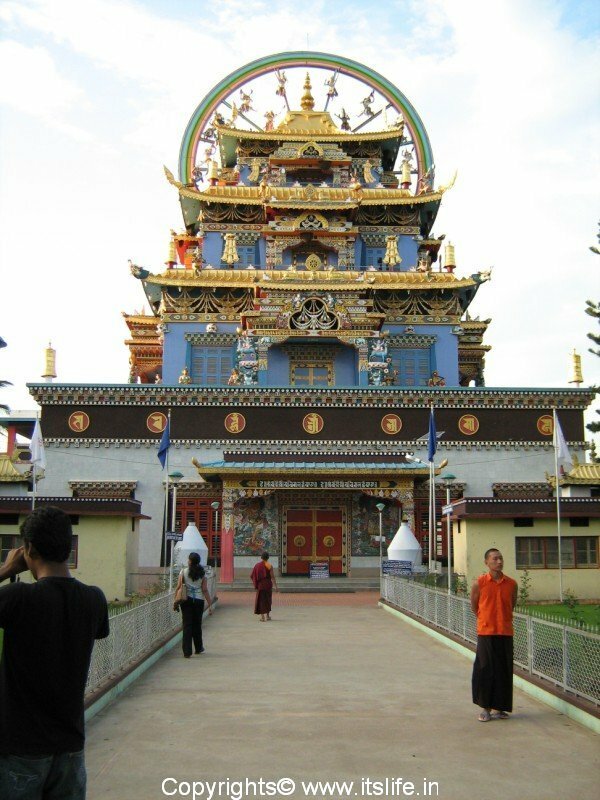 As you enter Bylakuppe you can see many Buddhist monks in their bright robes and Tibetan women and children going about their daily chores. The Namdroling Monastery also known as Golden Temple is situated here. 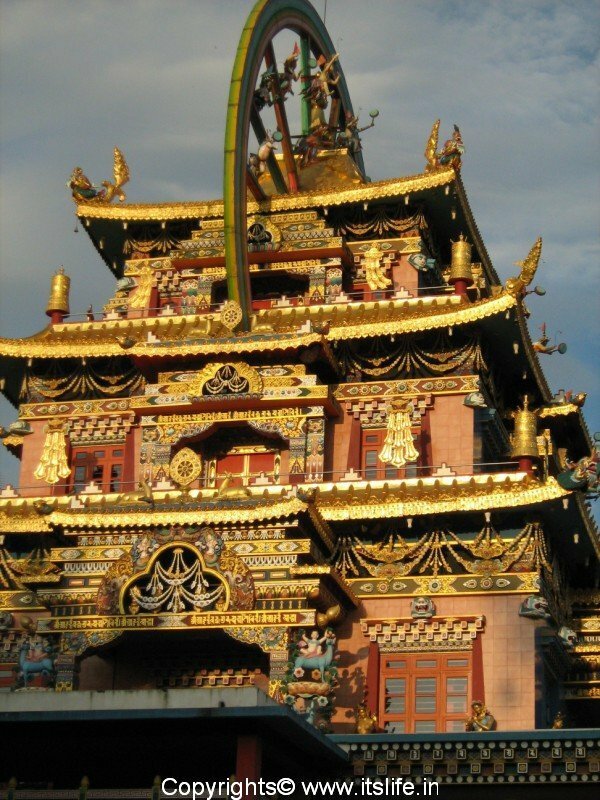 It is a beautiful temple with Tibetan mythology paintings and the idols of the Buddha covered in gold. 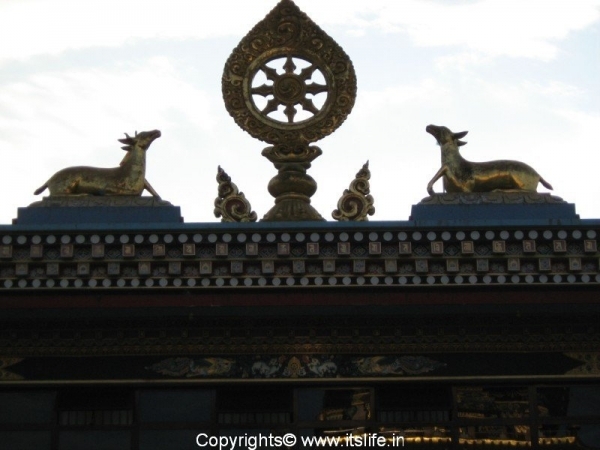 The Bell, the golden deer on the rooftop and the work on the pagoda of the Namdroling monastery are breathtaking. The monks, the shopping mall nearby selling Tibetan knick knacks, the weather, the golden temple itself, Buddhists chanting and clanging of the bell will make you feel that you are in Tibet. 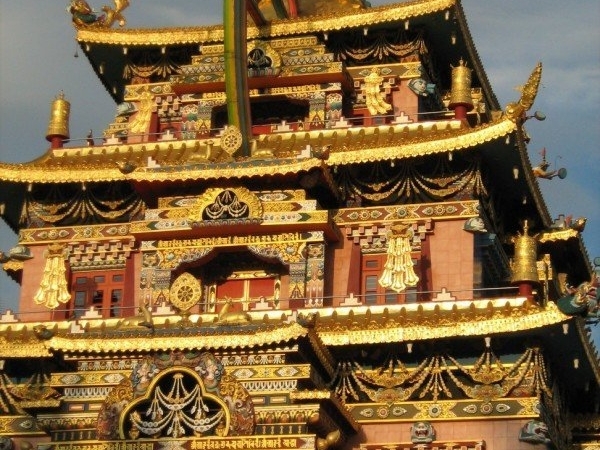 His Holiness Pema Norbu Rinpoche established the Golden Temple in 1963 after he came from Tibet. 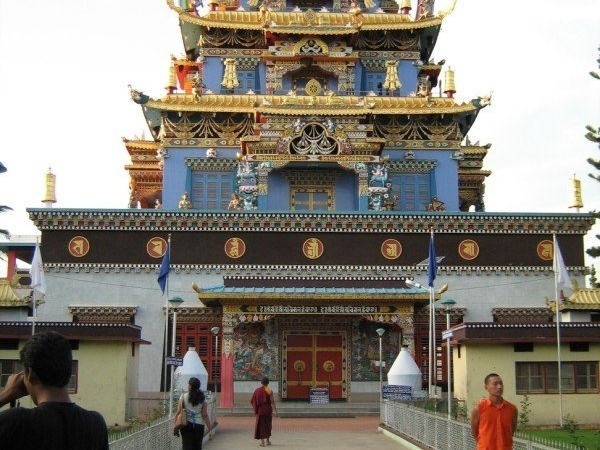 The original name of this monastery was Thegchog Namdrol Shedrub Dargyeling and His Holiness the Dalai Lama conferred the place with a shorter name Namdroling Monastery. 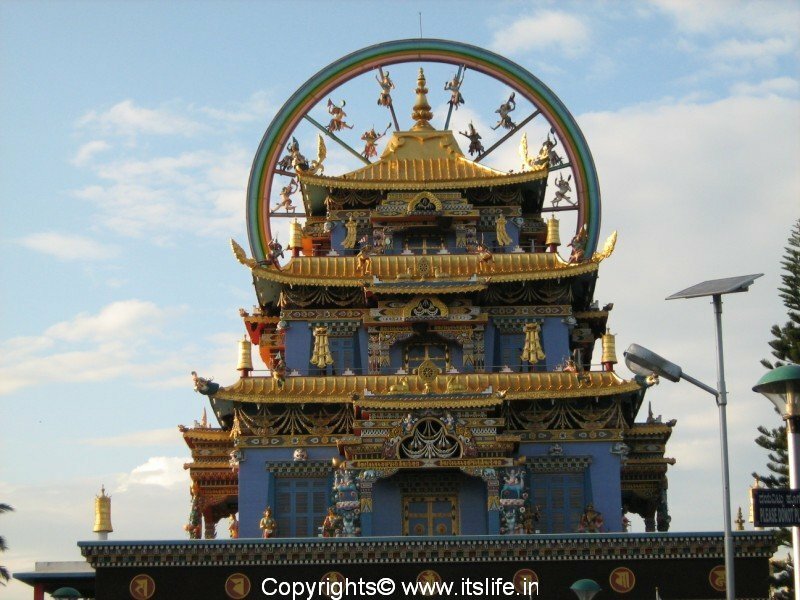 It takes the credit of being the largest teaching center of Nyingmapa – a lineage of Tibetan Buddhism in the world. 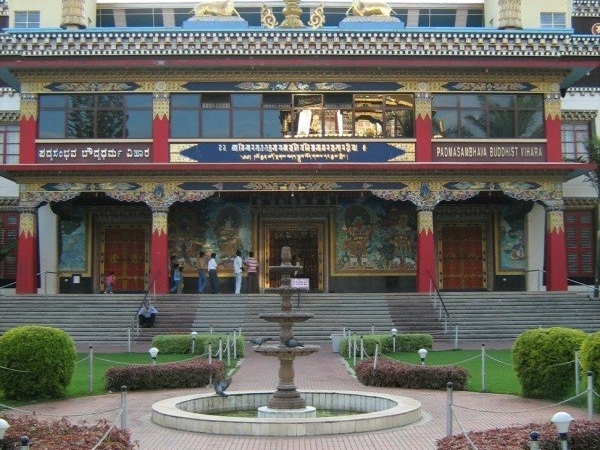 There are approximately 5000 monks and nuns in the teaching center perpetuating the teaching of Buddha. 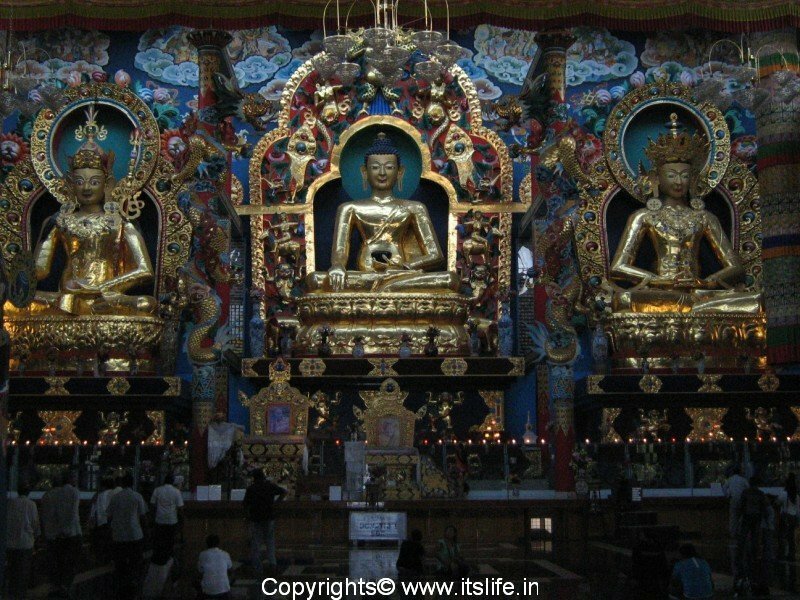 The Padmasmabhava Buddhist Vihara is a huge temple known as Golden temple with very large idols of Buddha covered in gold was completed in 1999. 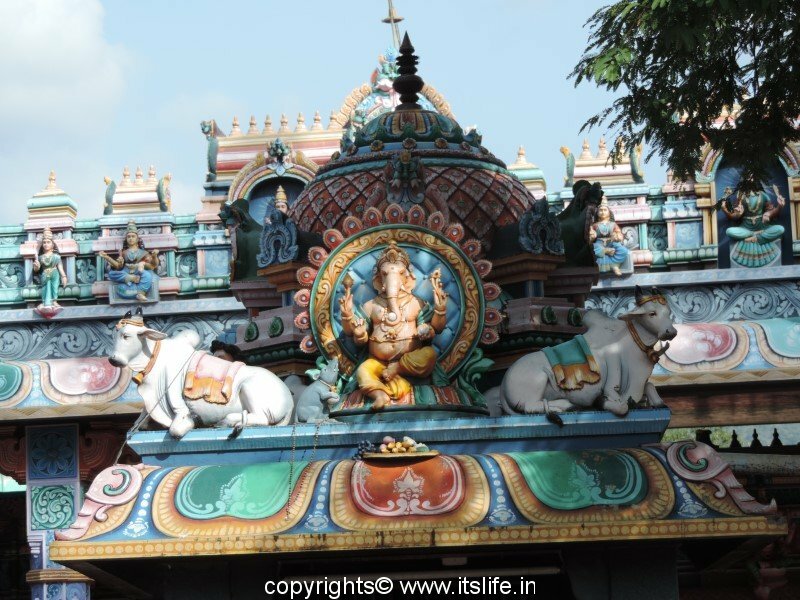 The idols are 18 meters in height. The prayer hall can accommodate thousands of monks at a time. Few minutes of meditation in the hall can rejuvenate and calm the restless minds. There is a Tibetan restaurant in the shopping complex selling Momos and Thukpa. 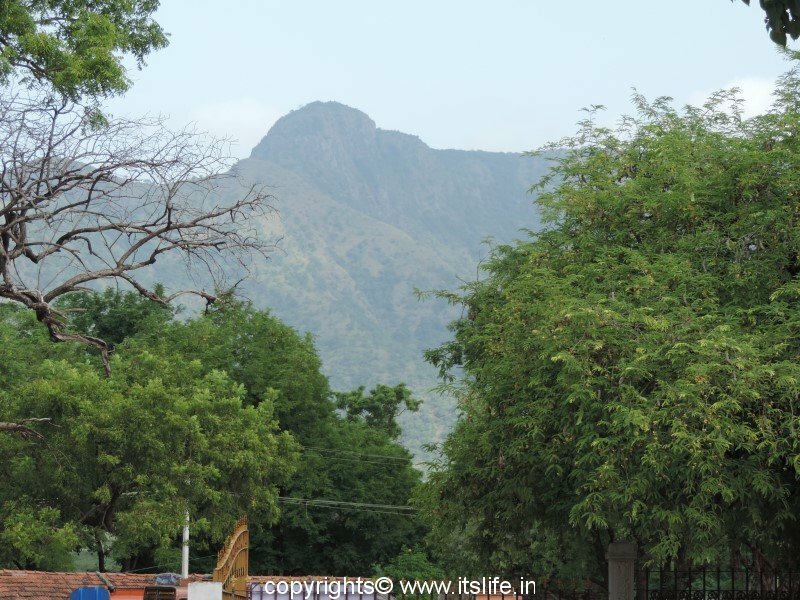 Places of interest near Namdroling Monastery are – Cauvery Nisargadhama 8 Km, Harangi Dam/Reservoir – 15 Km, Dubbare Elephant Camp – 20 Km and Abbey Falls. 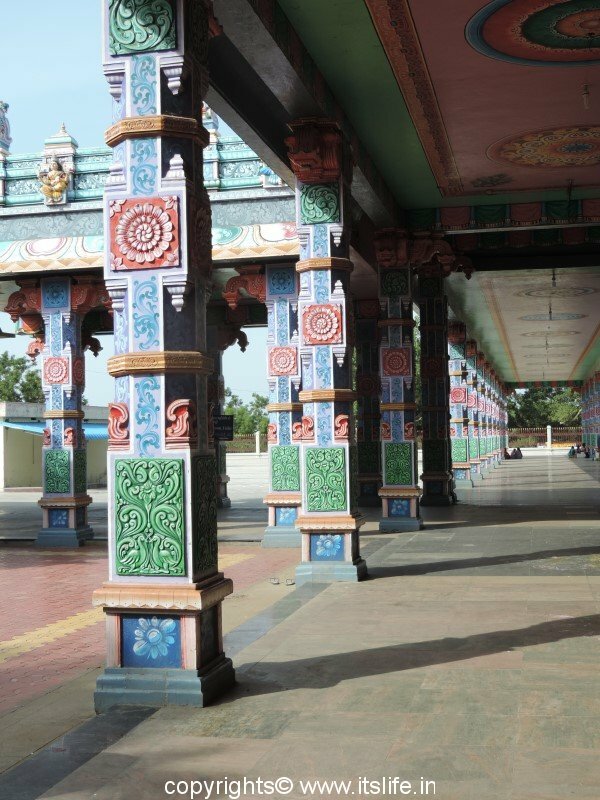 Transport – Well-connected road leads up to the Namdroling Monastery. 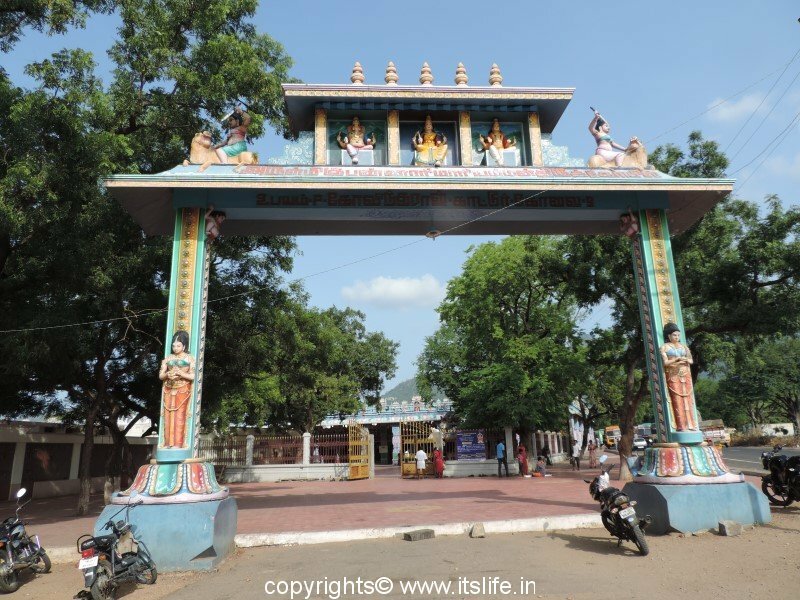 I am very curious to visit this monastery, as i havent visited any till date. Should we get any prior permission to get into this monastery? Are we allowed to take pics inside?? 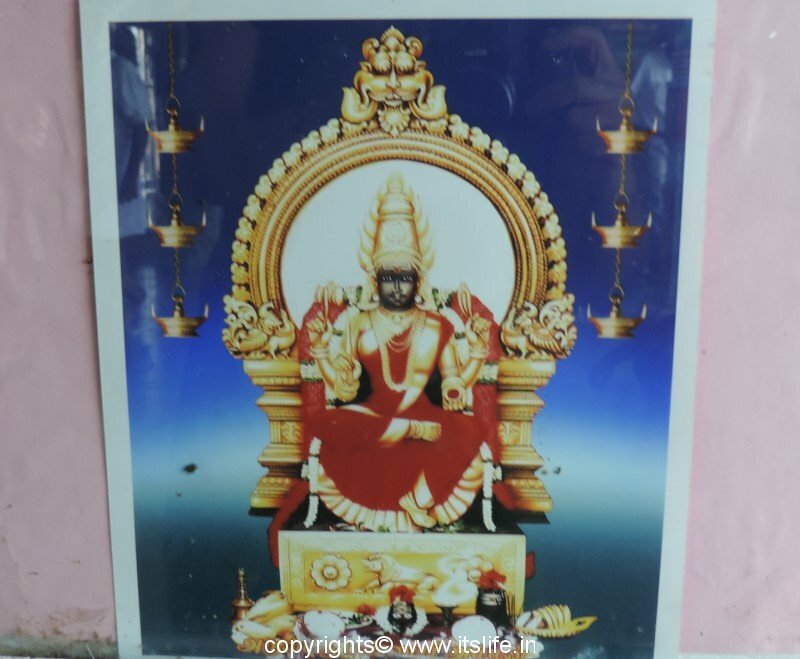 It would be of great help for me if you can help me in this. You can visit the monastery on any day and take pictures. There is no need to take permission, we just have to remove our foot wear at a designated place and be quiet. Enjoy your visit. Hey sorry, I visited late. But thanks for your response Shantha. 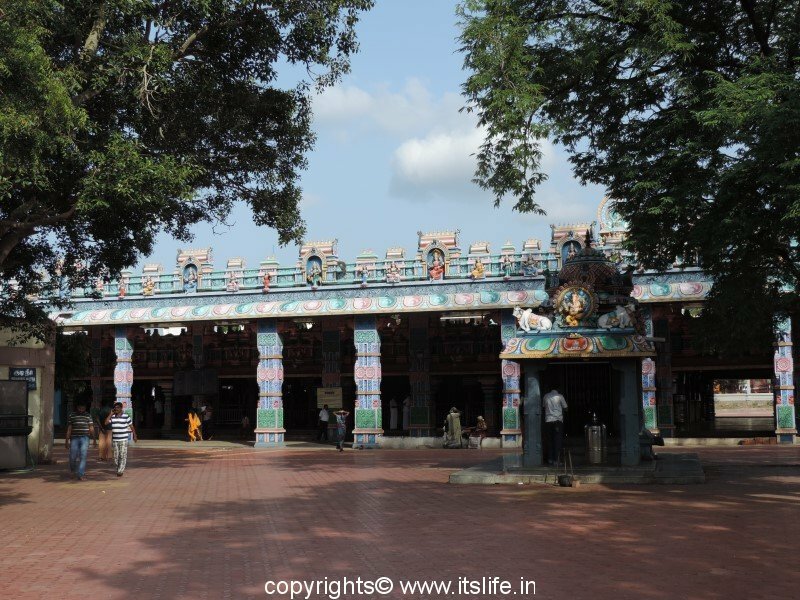 Really nice place to visit, specially a must visit on the way to Coorg from bangalore! 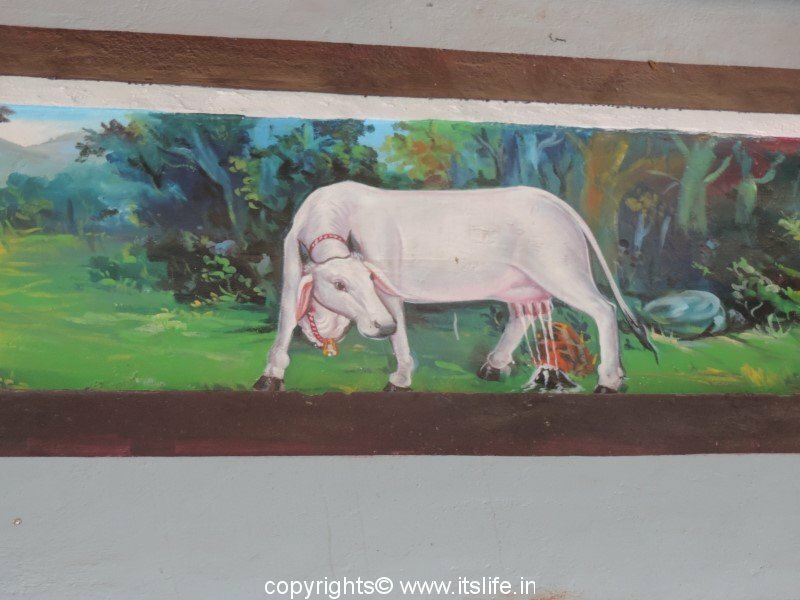 Yes Abhijit it is a nice place…. 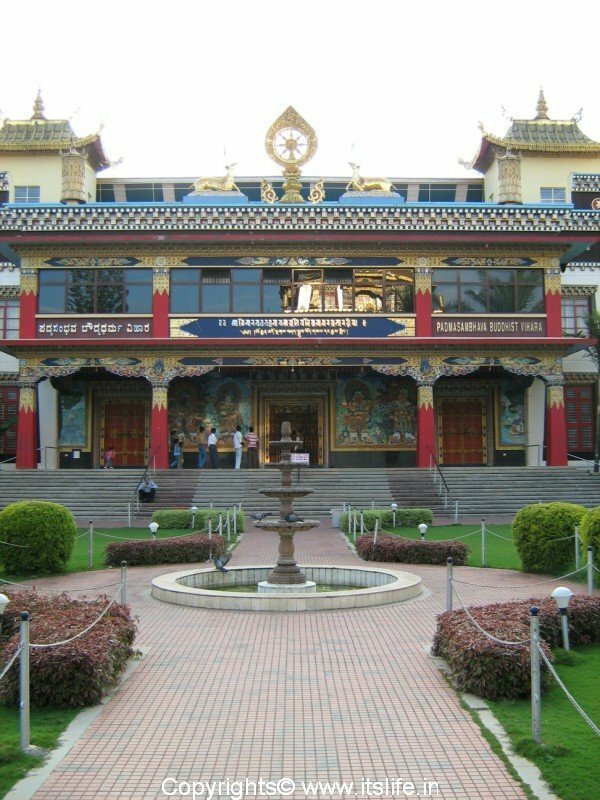 I am very seriously considering joining the Monastery as I want to dedicate the rest of my life to the Buddha, the Dharma and the Sangha. It would be great if I could speak with someone on this. Gopal you can contact the monastery. The details of the monastery are given in the above post. However, both the telephone number and the e-mail address are not functional. Is there any other way to get through to them? I am sorry Gopal that you could’nt contact the monastery. Please check the link below: http://www.namdroling.org. Consider visiting the place too. i would like to know whether they conduct any classes on mediation. is the monastery open on all days of the week for visitors. Yes, it is open all days of the week.